HomeBlogSEOGoogle Speed Update is now live! So what does this all mean? Well, from yesterday, page speed will be a ranking factor for mobile searches. 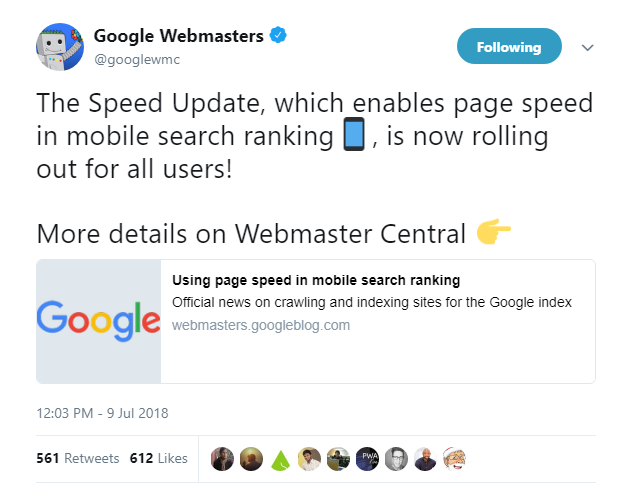 According to the initial blog from Google, the search engine said: “This update will only affect pages that deliver the slowest experience to users and will only affect a small percentage of queries.” Google Webmasters didn’t actually add to the news but posted on Twitter to show that it was live. Posting on the forum, Google Webmasters said: “The “Speed Update,” as we’re calling it, will only affect pages that deliver the slowest experience to users and applies the same standard to all pages, regardless of the technology used to build the page. “The intent of the search query is still a very strong signal, so a slow page may still rank highly if it has great, relevant content. To understand a little more about the update we asked Mark McGonigle, Head of Organic Search at Click Consult what he thought it would mean to clients. He said: “Now that Google have confirmed that they will be rolling out the Google Speed Update which will “only affect pages that deliver the slowest experience to users and will only affect a small percentage of queries.” Some online webmasters have already started to see a change in their mobile performance. Click Consult, as per standard practice, are keeping a close eye on our clients performance to see if this update is having an impact and will inform our clients accordingly should we see this. Whilst there has been no official statement on how Google actually determines if a page is slow or not, they have confirmed that there are several key metrics to look at and that webmasters should look at the Chrome User Experience report, the Lighthouse tool and PageInsights tool for an idea of what might be worth focusing on. For the latest in search marketing news and views, sign up to our blog – or for actionable insights, see our ever growing collection of resources. Alternatively, contact us to see what we can do for your brand.